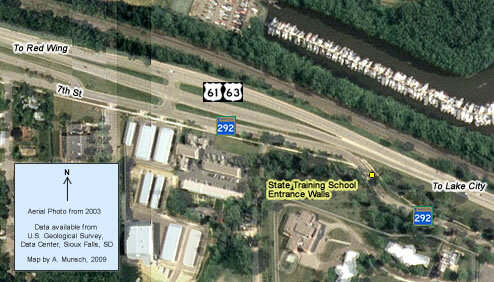 Located In: Red Wing, Goodhue County. 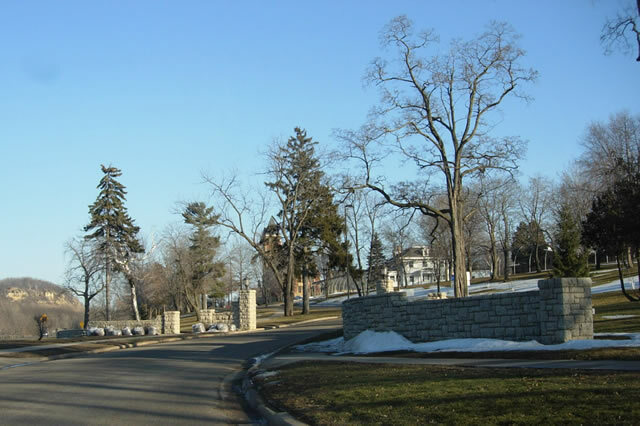 The entrance walls to the Red Wing Correctional Facility (formerly the Minnesota State Training School) were constructed in about 1935, most likely by federal relief labor. They once opened directly onto U.S. 61/U.S. 63. In 1963 the main highway was realigned slightly, and the old highway at the site became a service drive, as well as part of State Highway 292. Photos - Taken in March, 2007. The historic entrance walls, looking east on Highway 292 (modern U.S. 61/U.S. 63 is on the far left).